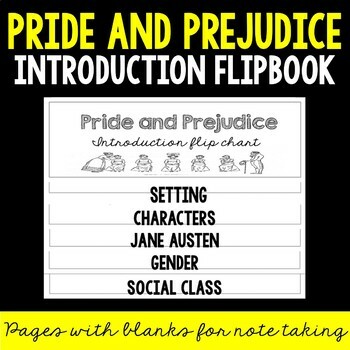 PRIDE AND PREJUDICE Fill-in-the-Blank Notes Flip Book! This flipbook serves as a perfect introduction to the novel Pride and Prejudice! 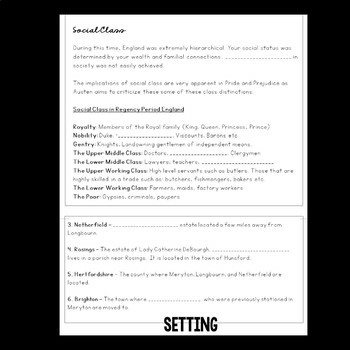 This flipbook explores: the setting of Pride and Prejudice, the social class social class and roles of gender in Regency period England, the characters, and Jane Austen. •	Students can follow along with you and take fill in the blank notes. •	Students can be broken up into groups and assigned one flap to read and discuss per group. They can teach the class about their assigned section. Assembly is quick and easy – you only a stapler, and five minutes! There are detailed instructions for assembly included!